Many governments are pursuing with relentless vigor a neoconservative/transnational corporate program of globalization, privatization, deregulation, cutbacks to social programs, and downsizing of the public sector. Countries are forming into giant ÃÂfree tradeÃ¢ÂÂ blocs. Increasingly they lack the will and desire to resist encroachments of world ÃÂsuperculture.Ã¢ÂÂ Furthermore, they encourage heightened commoditization of information and knowledge, for instance through stiffer intellectual property laws, through ÃÂInformation HighwayÃ¢ÂÂ initiatives, and through provisions in bilateral and multilateral trade treaties. 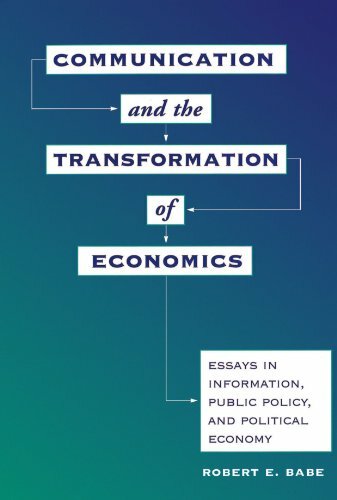 The analytical underpinning and ideological justification for this neoconservative/transnational corporate policy agenda is mainstream (neoclassical) economics.Focusing on the centrality of information/communication to economic and ecological processes, Communication and the Transformation of Economics cuts at the philosophical/ideological root of this neoconservative policy agenda. Mainstream economics assumes a commodity status for information, even though information is indivisible, subjective, shared, and intangible. Information, in other words, is quite ill-suited to commodity treatment. Likewise, neoclassicism posits communication as comprising merely acts of commodity exchange, thereby ignoring gift relations; dialogic interactions; the cumulative, transformative properties of all informational interchange; and the social or community context within which communicative action takes place.Continuing in the tradition of writers such as Russel Wallace, Thorstein Veblen, Karl Polyani, E. F. Schumacher, Kenneth E. Boulding, and Herman Daly, Robert Babe proposes infusing mainstream economics with realistic and expansive conceptions of information/communication in order to better comprehend twenty-first-century issues and progress toward a more sustainable, more just, and more democratic economic/communicatory order. About: Many governments are pursuing with relentless vigor a neoconservative/transnational corporate program of globalization, privatization, deregulation, cutbacks to social programs, and downsizing of the public sector.